One of the things we (ha ha, I should say “I”) have decided to change, is no commercial cereal for breakfast. It just did not keep my kids full for long enough. They would eat an entire bowl and then 2 minutes later scream about how hungry they were. Totally empty calories. 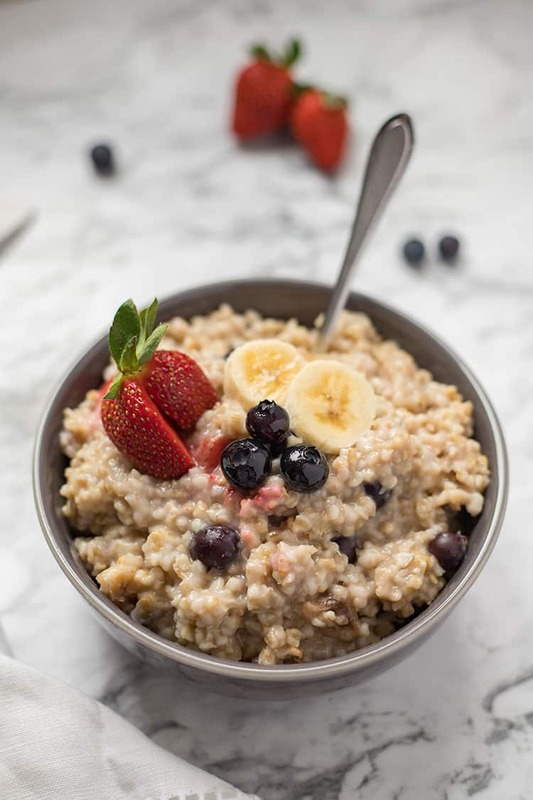 Enter the Instant Pot Easy Steel Cut Oatmeal! I have been SO lucky, even since they were little, my kids have always loved oatmeal. Because of dairy allergies and a tendency to get backed up, we couldn’t do the standard rice cereal when they were babies. So we did baby oatmeal. This steel cut oatmeal is super easy! It is fast and is a cinch to throw into the Instant Pot. No babysitting it on the stovetop. With coming to pressure and cook time, you should be ready to eat in about 20-25 minutes. One word of caution: Oatmeal can tend to get VERY foamy in the Instant Pot (or any pressure cooker). So you do have to be a little careful. It means you can’t fill your IP very full. And you’ll have to make sure you clean your vents out VERY thoroughly after each use. It’s also a little random – some days our oatmeal foams a lot, and sometimes hardly at all. I haven’t figured out what the difference is – yet. We add a half to 1 cup of fresh fruit after cooking and just gently stir it in. You can add fruit before cooking, but it basically just disintegrates into the oatmeal. Which still gives it great extra flavor, and makes for some nice colored oatmeal… 😉 But I recommend just adding it after cooking. 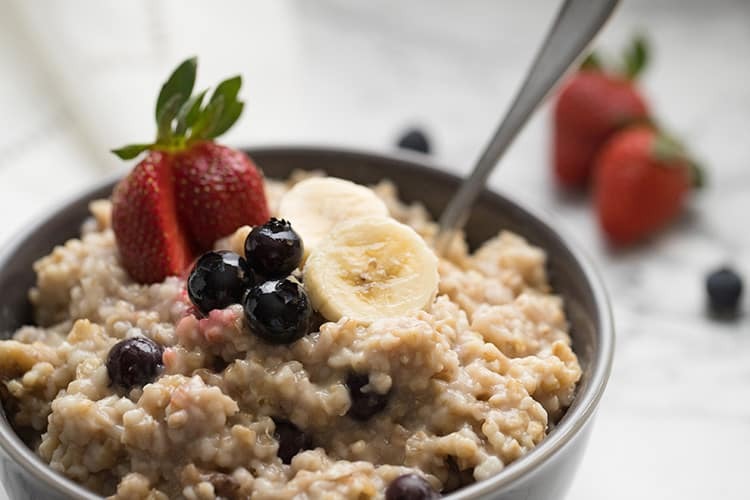 Hearty and filling, with a hint of nutty flavor, this Instant Pot Easy Steel Cut Oatmeal is a breakfast staple at our house! It is super easy to make and doesn't use refined sugars. Toss a batch in, go take a shower, and when you're done, breakfast is ready and waiting for you! Add all ingredients to Instant Pot. Stir to combine. Place lid on Instant Pot, close vent, and set to Manual/Pressure Cook on HIGH for 10 minutes. When time is up, vent using Quick Release method. When pressure has released, open lid and gently stir in fresh fruit (berries, bananas, peaches, etc.). Serve and enjoy! If using frozen fruit, allow the oatmeal to sit on Keep Warm in the Instant Pot for a few minutes to thaw the frozen berries before serving. Every time I tried to make oatmeal in the instant pot, it came out a little wrong- too dry, too wet, etc. Your simple recipe is just perfect and has the perfect level of sweetness to keep my toddler happy. Thanks!